In shaker with ice, add vodka and pear nectar; shake 1 minute. Place 1 maraschino cherry in bottom of martini glass. Strain mixture from shaker into glass. Sprinkle with cinnamon and nutmeg. Garnish side of glass with fresh pear slice. This recipe can easily be doubled or tripled to make more than one serving. 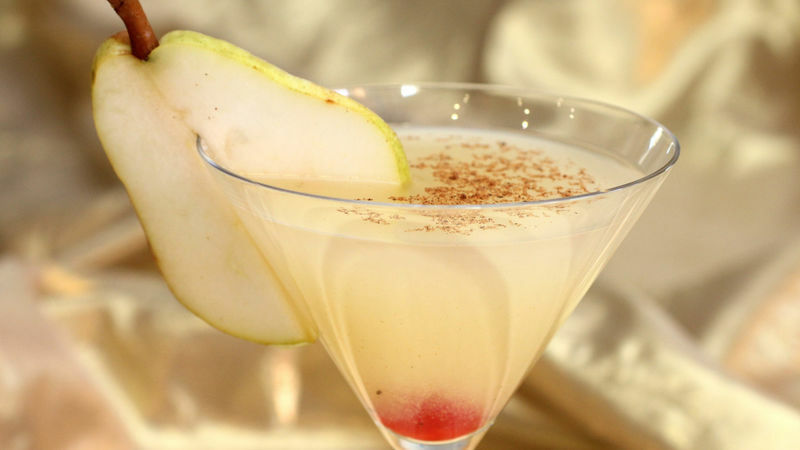 Whipped cream-flavored vodka works well with this recipe as well. If you don’t have a martini shaker, you can certainly just use a pitcher with ice or just use 2 cups of different diameters placed open end to open end to make a mock shaker. A little lemon juice squeezed over the pear slice will prevent it from browning if you cut it in advance.